Students will enjoy reviewing, practicing or brushing up on figurative language with this set of task cards. This set includes practice with personification, idioms, adages / proverbs, hyperbole, similes, metaphors, onomatopoeia, alliteration, imagery, palindromes and puns. 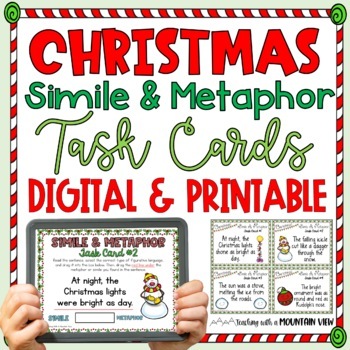 The printable pack includes 44 self checking task cards, directions... adapted and re-written the task cards so they don�t resemble much of the original. The cards use a wider variety of The cards use a wider variety of Bits and is more flexible for several students using a single Classroom Set of littleBits�. TEACHING ENGLISH WRITING RESOURCE Teach Figurative Language Posters Task Card CD Email to friends Share on Facebook - opens in a new window or tab Share on Twitter - opens in a new window or tab Share on Pinterest - opens in a new window or tab... adapted and re-written the task cards so they don�t resemble much of the original. The cards use a wider variety of The cards use a wider variety of Bits and is more flexible for several students using a single Classroom Set of littleBits�. 33 34 Figurative Language Task Card Figurative Language Task Card He kissed her forehead so softly while she The Whitehouse waged an all out war was �... Monitor and support the students as they independently complete the figurative language activities in the workbook. Once the students have finished, discuss the answers as a class. Once the students have finished, discuss the answers as a class. Use these 27 Figurative Language Task for ELA enrichment. Seven types of figurative language are included: simile, metaphor, idiom, hyperbole, personification, onomatopoeia, and alliteration.... Finally, I had the kids sit in a circle and we passed figurative language task cards around the circle. Two kids shared theirs, explained what they thought the simile or metaphor meant, passed their cards down two spaces, and then got new cards. It was a fun, fast way to do a little bit more review. Figurative Language is fun! 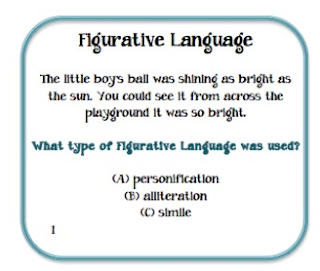 I use the CCSS aligned Summer Figurative Language Task Cards to provide an opportunity for review towards the end of the year.